Unless you are from Vermont or part of the decades old culinary education world then you may not know whom this person is. Fran Voigt was the founder and past president of New England Culinary Institute (NECI) that in its day was considered one of the finest schools for cooks in the country. I would dare say that during his tenure and throughout the growth of NECI – Fran is as important to the American Food Culture on the east coast as Alice Waters is on the west coast. The major difference is that Fran was not a chef, or a cook for that matter (although rumor has it he did wash quite a few pots and pans during the early days of NECI). Culinary Education in the United States (as we know it) really began in the late 1970’s. There were a handful of schools prior to that (The Culinary Institute of America was founded in 1946), but the incredible growth spurt of and interest in culinary arts as a college major began right around the time that NECI was founded in 1980 with seven students. At one time that enrollment had grown to nearly 600. Voigt began the school with his first instructor: Chef Michel Leborgne in Montpelier, Vermont with an idea that would grow to become the NECI model. Formulated as a mirror of the way that medical schools operate – Fran Voigt was a firm believer in “learning while doing”. He shunned typical educational models that limited the amount of time that students were required to be in class and pushed students to show their commitment in time and effort. From one restaurant in the Capitol Hotel – NECI would grow in Montpelier to include the operation of NECI on Main with two full service restaurants, a specialty high-end operation called Chef’s Table, substantial catering operations throughout the state, LaBrioche Bakery, the foodservice at Vermont College of Fine Arts, and the busy cafeteria and catering operations at National Life Insurance Company. Later on, as enrollment grew, the college added a campus at The Inn at Essex in Essex Junction, and the enormously popular NECI Commons in Burlington Square. At one point the college was even affiliated with a culinary school in Tortola, Virgin Islands. All of this from humble beginnings with an idea and the spirit of a true entrepreneur. What is most significant is that the school and Fran’s concept emerged at the same time that “farm-to-table” was coming of age. At the center of the connections between chefs and farmers were the states of California and Vermont. Fran Voigt was a strong advocate for these relationships. With roots in Cabot, Vermont – Fran lived among those hard working farmers who made it possible for chefs to practice their craft. He was an advocate for a return to a more decentralized approach that relied on seasonality, organic approaches towards farming, grass fed cattle, free-range poultry, composting and recycling, and building connections with those people who are just as passionate about the ingredients on the farm as the chef might be in the kitchen. Vermont grew as a center for the new food movement – the movement that was accentuated by Michael Pollan, Dan Barber, and Alice Waters. As the Vermont food scene grew with world-class cheese makers, grass fed cattle and pigs, organic produce and milk free of growth hormones, and an emerging craft beer and cider industry, so too did NECI grow. Fran Voigt and his dream were synonymous with Vermont. Those who graduated from the Voigt/NECI model were disciples for this food philosophy. Certainly in Vermont, but more and more across the country – NECI graduating cooks were maturing into a new generation of sous chefs and chefs with a passion for the farm to table mantra. It was quite common for prominent chefs to proclaim that if they had their choice they would always hire graduates from NECI: “They know how to hit the ground running”. A cadre of chefs worked their way through NECI kitchens as instructors and became an inspired group of faculty who shared the NECI concept with other schools – pollinating the field of education with this growing passion for farm connections and sustainable practices. I had the pleasure of working for NECI and Fran for four years in the early part of this century. It was rewarding, challenging, and enlightening. I reinforced my own passion for artisan food crafters and the beauty of the farm. I met incredible people who were passionate about vegetables, grains, milk, cheese, beer making, artisan bread, and everything to do with life on the farm. Those four years helped to mold my own philosophy and definitive “stakes in the ground”. I am a better teacher, chef, and person because of my time in Fran Voigt’s world and I will always be in his debt for that opportunity. We didn’t always agree, in fact we quite frequently disagreed, but I never lost respect for his passion, commitment, and sense of doing things the right way. Fran passed away this week and he will surely be missed and remembered. His legacy is that of an altruistic entrepreneur, a brilliant man with a vision, a zest for life, and a soft spot in his heart for farmers and chefs – people whose work ethic he admired. Thanks Fran – all of your disciples hope that the model you created lives on in whatever form NECI takes in the future. 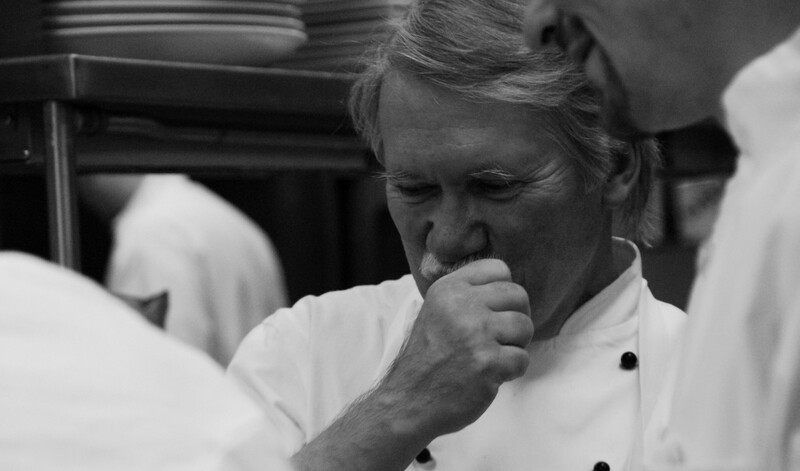 A tip of the chef’s toque to Fran – Rest in Peace. Thank you for a beautifully written acknowledgement of Fran’s passion and accomplishments. He remains an inspiration.